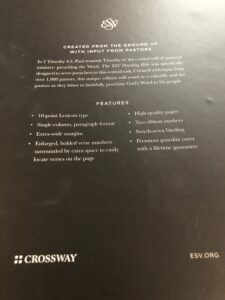 In the search for a Bible worthy of the pulpit, I commend to you that most excellent Preaching Bible from the good people at Crossway. 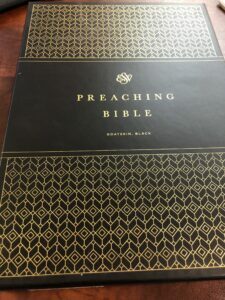 It has attained the pinnacle of Crossway’s offerings and if you will permit, I will provide a point by point case for this being the Bible worthy of your most excellent pulpit. 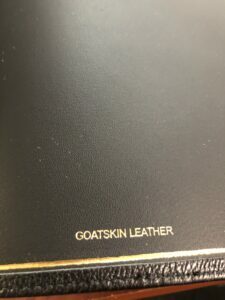 Charles, it is the most exquisite leather that my hands have ever touched. Perfectly aged and flawlessly grained, I have no Bible which feels better in my hand. The front is unencumbered by the profanity of stamping, simply a plain black cover. The spine, though stamped, is not profaned by that lettering. The lettering is a muted gold, stately and regal, not ostentatious in the slightest. I could easily expect to find this in the library at Oxford or Cambridge. My dear Charles, the layout is everything that you could want in a Bible. 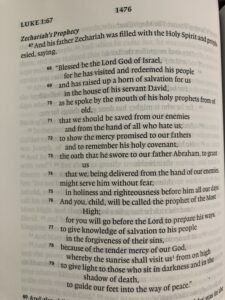 Crossway has laid out this Bible in a single column, paragraphed, format. 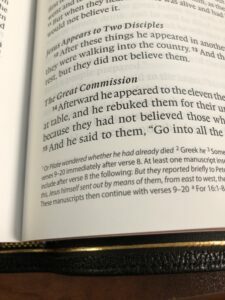 The font is just over 10-point and it is in Lexicon typeface, perhaps the most readable font I have seen in a Bible. 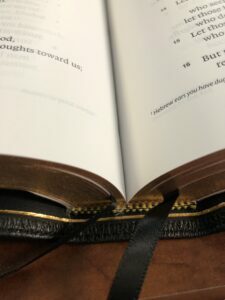 Crossway has paid the utmost attention to every detail the Expositor could need and added a 1.25 inch outer margin. This margin demands to be written in and is perfectly suited to adding your own annotations to the text. 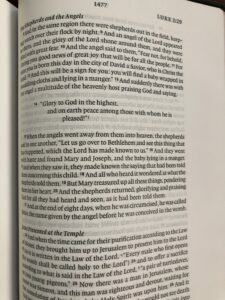 The soft paper is a delight to handle, thick enough to make the pages easy to write on but still thin enough to make the Bible easily portable. 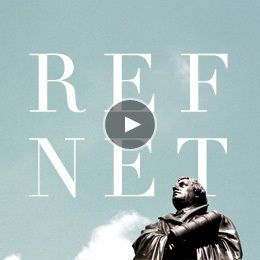 There are no references or other helps beyond translator’s footnotes. I do have mixed emotions about the lack of any helps. At my desk, I want helps for sermon prep but I do not want them in the pulpit, you understand. There is something different, almost mystical about this Bible. Even holding it commands reverence. 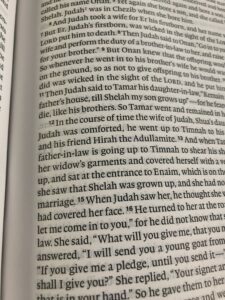 In the ESV Preaching Bible, you do not simply open the book and teach, you commune with the Scripture. You are one, a single unified tool in the Master’s hand. As the words flow off the page and out of you, the two come together in a way not experienced with other Bibles. The preacher and the Bible, together as God’s instrument of grace. In this single volume I fell in love with the Bible all over again and rekindled the fire of passion for God’s word. 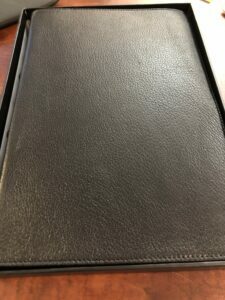 Having used it in mine own pulpit, I can attest to the joy of preaching from this Bible. It is everything I needed in a Bible and had not realized I want until I held it. 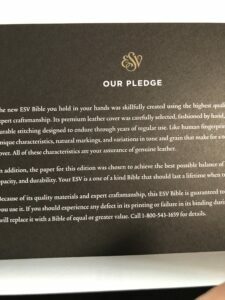 Charles, let me conclude with a word about the ESV herself. It is true that as Baptists we have a special affinity for the King James Bible but the ESV is a most worthy successor. Like the KJV, it is essentially literal in its translation and it is also very melodic in its language. The language is not flowery but it does flow ever so smoothly off the tongue. I give you, and all of our fellow servants, my highest recommendation. 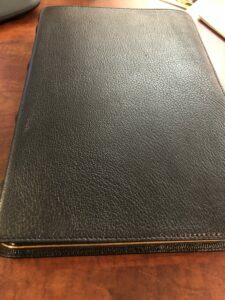 There is only one other Bible worthy of consideration for the pulpit, the Preaching Bible from Thomas Nelson. In truth, though, I cannot pick; I must use both as they are so appealing. A perfect 10 is the only fitting score for this Bible.